How much fertilizer should be applied to the lawn? When should fertilizer be applied? 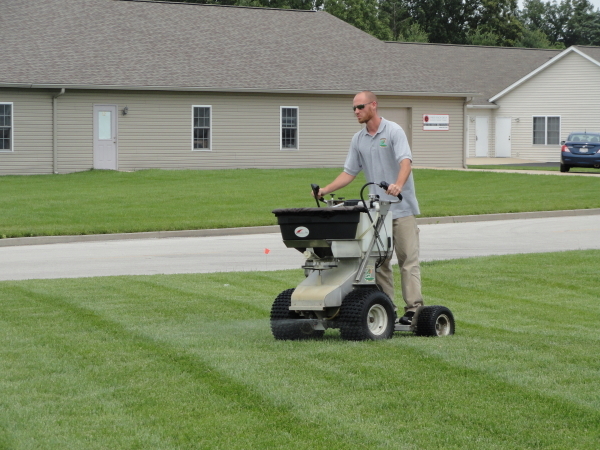 Many questions arise when it comes to fertilizing a lawn to be sure it is done correctly. Too much can be harmful yet too little can be ineffective. The amount of fertilizer needed for the lawn is based on lawn size and the amount of nitrogen needed throughout the year. In Illinois, where fescue is more commonly used, the recommended nitrogen rate is 3 to 4 pounds per 1,000 square feet over an entire year. The nitrogen (N) value within a bag of fertilizer will be listed on the bag as part of the NPK value and the rate to apply will be based off that value. For example, a 50 lbs bag of 20-04-10 fertilizer has 20% nitrogen and if applied at a rate of 3 pounds per 1,000 square feet the lawn would receive 0.60 pounds per 1,000 square feet. Therefore, a minimum of 5 applications would be needed during the course of the year to meet the minimum 3 pounds per 1,000 square feet. Also, in the above example the 50 lbs bag at a rate of 3 pounds per 1,000 square feet would cover a lawn size of 16,667 square feet. Therefore, knowing your lawn size and a properly calibrated spreader is extremely important when applying fertilizer. If a lawn receives too much nitrogen, a great amount of stress may occur and will typically result in a fertilizer burn. A fertilizer burn is an unsightly discoloration or death of the grass. The burn is caused when the salt form of synthetic fertilizer dries out on top of the grass and soil. Accidents do happen when applying fertilizer. A machine mishap could drop extra fertilizer or calculations can be miscalculated resulting in excess fertilizer being applied to one spot or over the entire lawn. If an accident happens, the best thing to do is try to clean up as much of the fertilizer as possible. If scooping the fertilizer up is not practical or if a large quantity remains, the area needs to be flushed with water. A burn is less likely to happen if the product is watered in properly. Timing is everything when it comes to applying fertilizer. Fertilizer applications should be balanced and applied according to the needs of the lawn during the time of the year applied. For example, applying too much nitrogen during the spring months can lead to excessive growth and thatch build-up. Not enough nitrogen in the spring can lead to weed issues. Applying too much nitrogen in the summer can lead to grass burns and diseases. Fertilizer, synthetic or organic, applications should be scheduled with an appropriate time apart as well. Applying too frequently results in stress and possible burn but spacing application too far apart can prove to be ineffective. Ideally, for a fescue lawn, typical fertilizer applications are done every 5 to 8 weeks. To sum it up, the amount of fertilizer and when to apply it is a like fine tuned machine. When all the components are functioning together and properly, things are going to look and run smoothly. Miss one little step of run into one little hiccup and things come to a screeching halt. Similar to woodworking, it is best to measure twice and cut once. Be sure that the lawn size is accurate, the calculations for fertilizer going down for that lawn size are accurate and that the scheduling is accurate.